It’s one year now, since Ingot Studios was launched. In that time, 9 artist/makers have been creating, thinking, painting, doodling, cutting, sawing, printing, etching and much more. This Saturday, at 7:30pm in P Café, they reveal some of the fruits of their labour at the inaugural Ingot Studios show. They hope to give you an idea of the range of work which has emanated from their brains and hands, as well as hosting a friendly welcome. Come along and say hello. 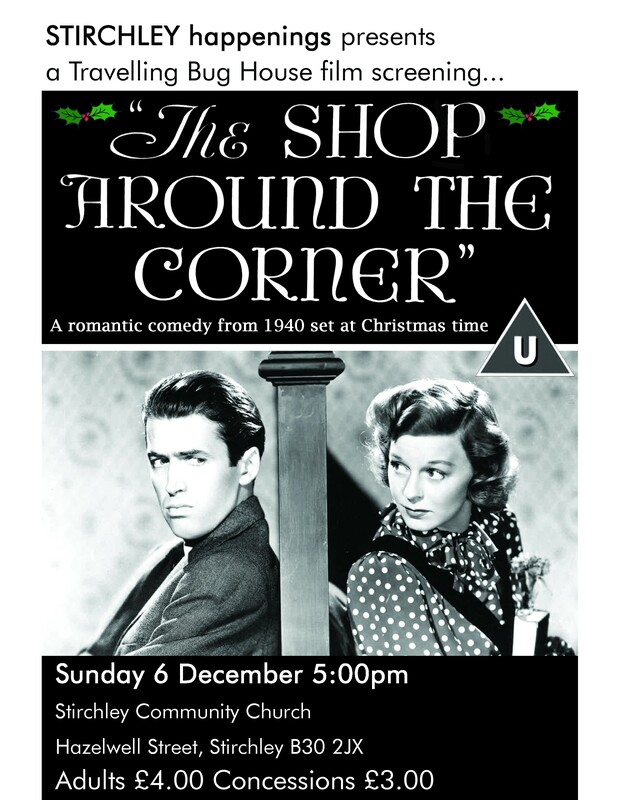 The Shop Around The Corner is a delightful film. Really funny. It made us laugh. And it’s set at Christmas, too. Released in 1940, it features screen greats Jimmy Stewart (did anyone say Vertigo?) and Frank Morgan (did anyone say Wizard of Oz?) alongside Margaret Sullavan, who was not too shabby herself, having been nominated for an Academy Award in 1938. The film is a romantic comedy. It’s good. It was selected for preservation in the United States National Film Registry in 1999, which is before we even first started having a tentative waft of thoughts about screening popcorn-fuelled shifting shapes (i.e. films) in Stirchley. But really, don’t just listen to us, the infallible Internet Movie Database gives it a score of 8.1 out of 10, which means a) we’re not lying and b) if you come and watch it you’ll most likely have a super time. The screening will take place at 5pm on Sunday 6th December at Stirchley Community Church, Hazelwell Street, B30 2JX. Tickets are £4 adults, £3 concessions, on the door. It’s suitable for families but not a children’s film, as such. We’d love to see you there! This summer, Ingot Studios launches in Stirchley – a workspace for artists, makers, thinkers and doers. Established by Stirchley Happenings member Tom Cahill-Jones, nine individual plots are available, suitable for people looking for affordable studio space and wanting to be part of a new creative community. Informed by its open-plan design, an interest in the possibilities of collaboration would also provide a good fit. The price is £65 per month per plot. Ingot Studios is holding two open days to give people the chance to view the space. Tickets (free) should be booked via the links below. 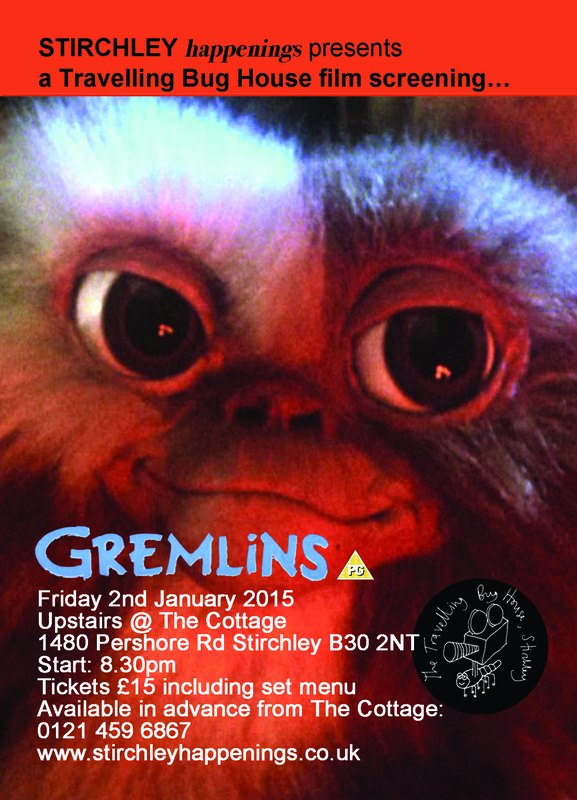 GREMLINS are coming to Stirchley! Stirchley Happenings’ Travelling Bug House will be back to help you celebrate the new year with this balti n’ blockbuster seasonal combo! Munch on The Cottage’s finest baltis whilst watching furry fury and chaos unravel in this horror-comedy Christmas classic. Date: 8:30pm, Friday 2nd January. Venue: Upstairs at The Cottage, Stirchley, 1480 Pershore Rd, B30 2NT. Tickets are priced at £15, and that includes a poppadom, a main course, rice or naan, and tea afterwards. You must pre-book your meal from a set menu beforehand, so make sure to ask the Cottage about the selection. Food will be served at 8:30pm sharp and then the film will begin once everyone has got their grub. Places for our curry/film nights go really quickly, so it might be worth calling ahead to see if The Cottage have any tickets left before you head down there to pick one up on 0121 459 6867. We’re excited to be back at Stirchley Community Church for our fifth Christmas film screening on Saturday 13 December – and this year it’s a double whammy. We thought no other film could contrast better with this stark realism than The Muppet Christmas Carol (1992). Whilst there is some thematic overlap (redemption, personal tragedy, family strife) this one is generally much more puppetty (with increased levels of furriness and spontaneous song). There will be a short break in between for drinks and snacks. Tickets are available from the Church café, Stirchley Community Market (Tuesday 4 December) and on the door. Stirchley Happenings presents a programme of short films at Loaf Cookery School and Bakery, from 8pm on Thursday 12th June. Tickets cost £10/£8, and will include a selection of filmic food from the Loaf kitchen, so it’ll be a good idea to come with an empty stomach. The shorts will culminate with Charlie Chaplin’s ever-hungry Little Tramp in ‘The Immigrant’, via archive Brummie footage, a singing fish, and a talking ham sandwich, with drinks available at the event courtesy of the ever-brilliant Stirchley Wines. Join us on Sunday 25th May for an afternoon of free live music and sunshine* at the British Oak, Stirchley. From 2 – 4.30pm we’ll have sets from London’s finest arthropod band, Barnacles and West Midlands-based singer songwriter Chris Tye in one of Birmingham’s best beer gardens. *we can’t guarantee sunshine, but if it rains we’ll be under-cover on the patio.